I first heard about this book in the bibliography of a craft book I was studying, and thought it sounded intriguing enough to track down via Interlibrary Loan. It delivered, though not in the way I was first expecting. It is a delicate biography, mostly because it isn't one at all. The author decides to write about this intriguing character, John Craske (b1881, d1943) but finds that there isn't all that much to discover. 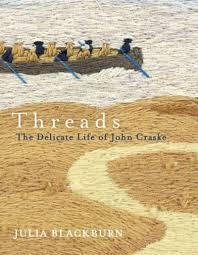 The book is about more than Craske himself; it's also about her search for him -- the places she goes to do her research, the people she encounters along the way, related to Craske or not, and her own life story is inextricably linked to the narrative, as her husband dies during the course of her writing this book. Blackburn also visits a couple of small regional museums and institutions that hold a few of Craske's remaining works, finding them poorly stored, not exhibited, or shown a lot of care. They seem to treat them as the output of a local artisan, not worth too much attention. 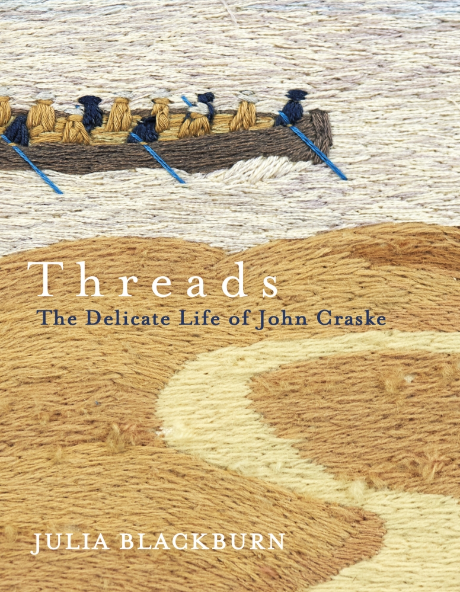 I hope that this book can at least inspire those places to preserve Craske's work for the future; they are original, with a individual viewpoint. Hi Melanie, This book sounds intriguing! There are actually two copies in the libraries around my state, so I have put a hold on a copy. Just looking at the cover - I find it amazing that somebody could do this in thread, when they have not spent years practising, having the odd class, and just generally being immersed in thread activities. Which I guess, just goes to show that there are people who just 'see' what has to be done to capture the feeling of movement and the environment. You can see the the water moving, imagine the sandy shore with the lumps and bumps and a worn track through it. I struggle to even 'copy' such works (with very clear instructions), but to do a design of my own I can't imagine. Any tapestry I have attempted have been with lots of directions. Obviously the skills of painting, to a skilled artist, are very similar to drawing with thread, and it is still possible to get a bit of a fluid appearance. I will look forward to reading his story. What a lovely way to start a Saturday morning - a cup of coffee and a book review! Glad it interests you! Yes, he seemed to be a natural -- took his painting and just translated it right into thread. Apparently his wife taught him the basics. This biography is bits of him interspersed with other essay bits but I hope you will enjoy the free form of it. I found it fascinating. This sounds like a very interesting read. Thanks for the recommendation, Melanie. It was really unusual, and I'm glad I stumbled upon it! I am still slowly reading this book. It is a 'slow' book, not a fast read and a lot to take in. It intrigues me a book can be published with so little actual information about somebody who is not all that well known. And yet, here in Tasmania, in my local library there are two copies!! There aren't even two copies of best sellers most of the time. But I am enjoying it. Slowly. Yes, isn't it interesting that there is this whole book about a person whose life could probably have been contained in a pamphlet? I was fascinated by how she put this together. Amazing that there were two copies in your library - none in mine, I had to interloan it!